A white sand beach on a small island off the southern coast of Thailand, typical of the natural beauty all over the country. 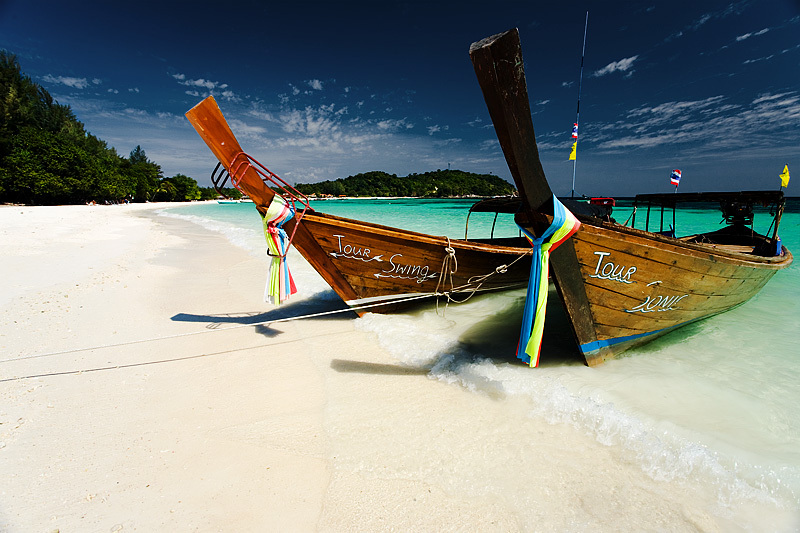 These longtail boats are powered by used automobile engines and form a large part of the local transportation around the islands of Thailand. It's a hike to get to the island from Bangkok, involving an overnight bus/train then a 3-hour boat ride. However, the isolation and crystal clear waters draw the same group of travelers, year after year. when i made it to Lipeh, i thought i was going to enjoy that little jewel being the only italian there. then i found out there was an italian pizzeria AND 25 students of an italian university doing research. nevertheless, i loved it. it was a very good advice! yo 'mona! Turns out there are even more Italians now than there were when you were here! At least they've left a trail of delicious pasta restaurants on the island!